Aunque no escriba por aquí mucho, sigo dentro! Uno de los problemas que me he dado cuanta es que cuando nos metimos en $gxy el AUS era 0,71eur pero actualmente es 0,67eur así que en realidad pese a que la media algunos la tenemos cercana al 2,5 aus$, necesitariamos que subiera más para ver en verde tal como esta la moneda actual (2,75$). Así que tocara armarse de paciencia y pensar en los años que nos quedan! Un saludo a todos! PD: @millonario te leo en el foro australiano, imagino que eres tu "español"
Sí ya voy viendo, yo no hablo pero llevo tiempo por ahí! Crashman lo sigo en twitter, y si que es verdad que parece bueno interpretando graficos y demas... Thesi he hablado con ella por twitter por privi. De momento llevamos una buena bajada de nuevo, veremos a ver como avanza el asunto! Un saludo y suerte a todos! La divergencia de precios entre las existencias mundiales y locales de litio ha impulsado a algunas compañías australianas cotizadas en acción. 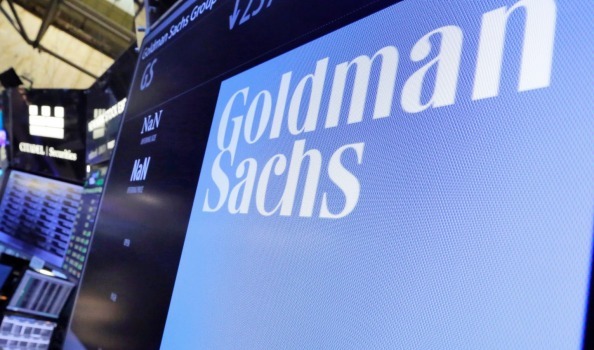 Street Talk entiende que uno de ellos es Galaxy Resources, que ha llevado a Goldman Sachs a su carpa como asesor de defensa. Esta columna no está sugiriendo que Galaxy haya recibido un acercamiento o está a punto de hacerlo. Pero en el contexto actual, tiene sentido que Galaxy apoye a su equipo asesor. Ciertamente, las acciones de los jugadores de litio australianos no han experimentado el mismo impulso que sus rivales mundiales en 2017, lo que en teoría podría hacer de este mercado un campo de caza feliz. La capitalización de mercado de Kidman Resources está en torno a los 213 millones de dólares, lo que la convierte en presa fácil de un gran depredador mundial. Las acciones de Galaxy subieron a 2,46 dólares en mayo de este año y el jueves cambiaron de manos a 1,755 dólares, lo que le dio a la compañía un límite de mercado apenas de 700 millones de dólares. En marzo, Galaxy estaba entre varios aspirantes de litio australianos nombrados en una presentación lanzada por el gigante de litio estadounidense Albemarle, que clasificó la calidad de los activos de las minas de litio del mundo. Albemarle y otras grandes empresas, que tradicionalmente han producido litio a partir de salmueras, han estado rondando Australia Occidental para obtener activos de litio de roca dura que pueden tomar una participación en, o sacar completamente. Aunque el litio a base de salmuera es más barato de producir, las fuentes han dicho que los fabricantes asiáticos de baterías han manifestado su preferencia por el litio de alta calidad derivado de los activos de hard rock. SQM de Chile adquirió la mitad del proyecto de litio Earl Grey de Kidman Resources por US $ 110 millones en julio, y varias compañías chinas de litio y químicos tienen participaciones en proyectos de Australia Occidental. Los mineros locales también han hablado de la batería y los fabricantes de automóviles están interesados ​​en asegurar la oferta. Galaxy tiene la mina de roca dura Mt Cattlin en WA, pero su huella geográfica más amplia y diversificación de la producción puede ampliar su atractivo. También tiene el proyecto de desarrollo de hard rock de James Bay en Canadá y el proyecto de desarrollo de salmuera Sal de Vida en Argentina. El presidente de Galaxy, Martin Rowley, conoce bien el equipo de recursos de Goldman. El banco de inversión es también el asesor de defensa de First Quantum, que Rowley co-fundó y fue director de hasta principios de este año. 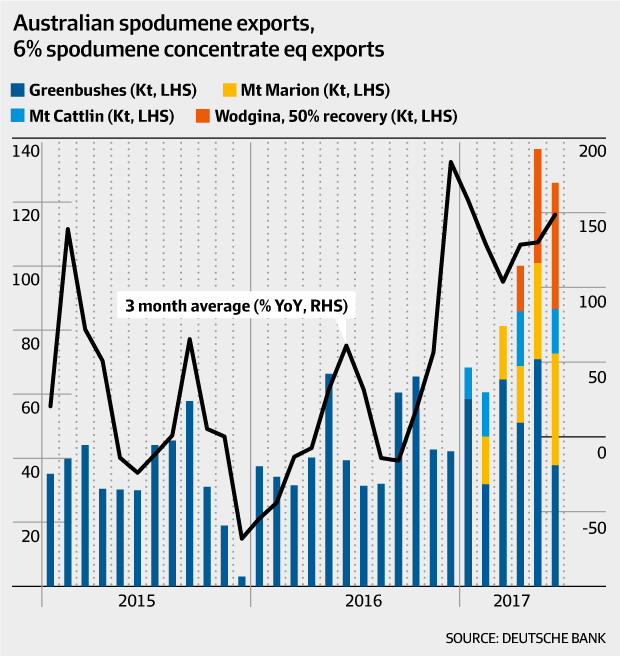 The price divergence between global and local lithium stocks has spurred some Australian listed companies into action. Street Talk understands one of those is Galaxy Resources which has brought Goldman Sachs into its tent as a defence adviser. This column is not suggesting Galaxy has received an approach or is about to. But against the current backdrop, it makes sense for Galaxy to shore up its advisory team. Certainly, shares in Australian lithium players haven't experienced the same boost as their global rivals in 2017, which in theory could make this market a happy hunting ground. 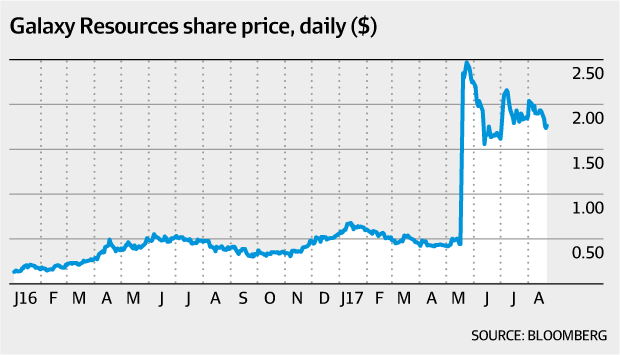 Kidman Resources' market capitalisation is hovering at circa $213 million, making it easy prey for a large global predator. Galaxy's shares rallied as high as $2.46 in May this year and on Thursday were changing hands at $1.755, giving the company a market cap just shy of $700 million. In March, Galaxy was among several Australian lithium aspirants named in a presentation released by US lithium giant Albemarle that ranked the asset quality of the world's lithium mines. Albemarle and other majors, which have traditionally produced lithium from brines, have been prowling Western Australia for hard rock lithium assets they can take a stake in, or take out completely. While brine-based lithium is cheaper to produce, sources have said Asian battery manufacturers have stated a preference for the higher quality lithium derived from hard rock assets, driving brine-based companies and upstream players to look at deals they would not have previously considered. Chile's SQM acquired half of Kidman Resources' Earl Grey lithium project for $US110 million in July, and a number of Chinese lithium and chemicals companies have stakes in West Australian projects. Local miners have also talked of battery and car manufacturers being keen to secure supply. Galaxy has the hard rock Mt Cattlin mine in WA but its wider geographic footprint and production diversification may broaden its appeal. It also has the James Bay hard rock development project in Canada and the Sal de Vida brine development project in Argentina. Galaxy's chairman Martin Rowley knows the Goldman resources team well. The investment bank is also the defence adviser for First Quantum, which Rowley co-founded and was a director of until earlier this year. In morning trade the Galaxy Resources Limited (ASX: GXY) share price has climbed 2% higher to $1.76 after the lithium miner released its half-year update. Half-year revenue since May 1 of $14,975,000. Half-year loss after tax of $6,000,000. Spodumene production for the half-year was 56,465 dry metric tonnes (dmt). Production of 14,038 tonnes in June, equating to an annual run rate of 168,000 tonnes. Redesigned Mt Cattlin average recovery rates of 61% in June. Average realised sales price of US$724/dmt in the June quarter. June cash costs of US$334/dmt. Revised Sal de Vida DFS estimates a post-tax net present value of US$1.4 billion at an 8% discount rate. Outlook: Cash costs will continue to reduce in the second-half. While the financial result may not be much to get excited as it only includes sales made from May 1, I think the level of production, average recovery rates, and the reduction in cash costs were very impressive. Galaxy’s production certainly has been increasing at a strong rate over the last few months. Almost a quarter of its first-half production came from the month of June alone. This puts the company on an annual run rate of over 168,000 tonnes. In June Galaxy’s cash costs reduced to just US$334 per dry metric tonne. As low as this seems, it is expected to go even lower as the second-half progresses. Which should result in strong margins for the company, especially with the company enjoying an average realised sales price of US$724/dmt in the June quarter. Furthermore, Galaxy has now completed its 2016 contract off take supply obligations priced at US$600 per tonne. As a result, all future shipments are now based on 2017 pricing terms of US$830 per tonne for 5.5% grade lithium concentrate, rising to US$905 per tonne for 6% grade product. Finally, I was pleased to see that a revised DFS study at the company’s Sal de Vida operation resulted in an increase in its post-tax net present value to US$1.4 billion at an 8% discount rate. I see Sal de Vida as a key part of Galaxy’s future and it really isn’t hard to see why. Management believes it has the potential to generate average annual revenues of US$354 million and average operating cash flow of US$273 million. I continue to believe that Galaxy is one of the best options in the resources sector. It may be volatile and reasonably high risk, but I believe its world class assets and the ever-increasing demand for lithium puts it in a great position to beat the market over the coming years. The miner says it has been in direct contact with major US and European car makers.Picture: AP Galaxy Resources chief financial officer Alan Rule says the lithium miner has been in direct contact with major US and European car manufacturers looking to lock in a secure supply of lithium for batteries that will power their electric vehicle models in the years ahead. Echoing comments by the managing director of fellow lithium miner Pilbara Minerals, Ken Brinsden, at the Diggers and Dealers Mining Forum in Kalgoorlie yesterday, Mr Rule told delegates the big auto manufacturers had done their homework and didn’t want to be caught short. “They have told us that they have done due diligence on 200 aspiring lithium miners in the world and believe only 10 of them will survive,” he said. Mr Rule also noted it was difficult for aspiring miners with greenfields lithium projects to secure finance, citing the examples of Pilbara Minerals and Altura Mining being forced to go to the high-interest bond market for project financing. “So supply going forward is the problem,” he said. Mr Rule said the strong demand for lithium and the company’s existing cash flow from its Mt Cattlin spodumene project near Ravensthorpe put Galaxy in a strong position to secure finance, equity partners and offtake agreements for the company’s Sal de Vida lithium brine project in Argentina and its James Bay spodumene project in Canada. Galaxy would spend $5 million on each project this year. Meanwhile at the company’s Mt Cattlin project, Mr Rule said the company was working on lowering costs and improving recovery rates. He said the project was operating at a 170,000tpa run rate and the company was aiming to boost recoveries from 61 per cent to 70-75 per cent and lower costs to below $US300/t. He gave cost guidance of $US325-$US350/t in the year ahead. Low operating costs and strong prices for its spodumene concentrate product ($US770/t) meant Galaxy was generating $US70-$US75 million in free cashflow a year from Mt Cattlin, Mr Rule noted. Galaxy shares were down 2.5¢, or 1.25 per cent, at $1.975 at 10.55am. Should you buy Bed Bath & Beyond Inc (BBBY) based on it’s P/E ratio? Is It Time To Buy Keyera Corp (TSX:KEY)? Only 6 days left to Plus500 Ltd (AIM:PLUS)’s ex-dividend date, should you buy? Why Incyte Corporation (INCY) Has Low Debt On Its Balance Sheet? How Financially Strong Is Impax Laboratories Inc (IPXL)? Is Galaxy Resources Limited’s (ASX:GXY) Balance Sheet Strong Enough To Weather A Storm? How does GXY’s operating cash flow stack up against its debt? ASX:GXY Historical Debt Aug 31st 17 Unxpected adverse events, such as natural disasters and wars, can be a true test of a company’s capacity to meet its obligations.These catastrophes does not mean the company can stop servicing its debt obligations.Can GXY pay off what it owes to its debtholder by using only cash from its operational activities? In the case of GXY, operating cash flow turned out to be 0.54x its debt level over the past twelve months. A ratio of over 0.5x is a positive sign and shows that GXY is generating more than enough cash from its core business, which should increase its potential to pay back near-term debt. Can GXY pay its short-term liabilities? ASX:GXY Net Worth Aug 31st 17 In addition to debtholders, a company must be able to pay its bills and salaries to keep the business running. As cash flow from operation is hindered by adverse events, GXY may need to liquidate its short-term assets to meet these upcoming payments. We should examine if the company’s cash and short-term investment levels match its current liabilities. Our analysis shows that GXY does have enough liquid assets on hand to meet its upcoming liabilities, which lowers our concerns should adverse events arise. Is GXY’s level of debt at an acceptable level? While ideally the debt-to equity ratio of a financially healthy company should be less than 40%, several factors such as industry life-cycle and economic conditions can result in a company raising a significant amount of debt. GXY’s debt-to-equity ratio stands at 2.37%, which indicates that the company faces low risk associated with debt. No matter how high the company’s debt, if it can easily cover the interest payments, it’s considered to be efficient with its use of excess leverage. A company generating earnings at least three times its interest payments is considered financially sound. GXY’s profits only covers interest 0.24 times, which is deemed as inadequate. Debtors may be less inclined to loan the company more money, giving GXY less headroom for growth through debt. Although GXY’s debt level is relatively low, it has the ability to efficiently utilise its borrowings to generate ample cash flow coverage. In addition to this, the company will be able to pay all of its upcoming liabilities from its current short-term assets. 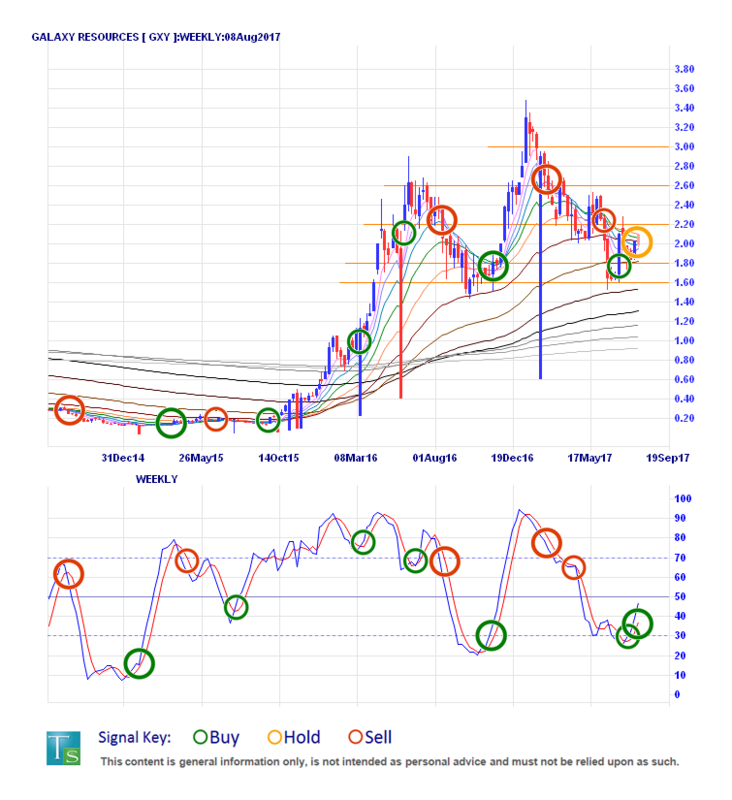 Now that you know to keep debt in mind when putting together your investment thesis, I recommend you check out our latest free analysis report on Galaxy Resources to see what other factors for GXY you should consider.